We arrived late to Kathmandu. We left the airport and negotiated with several cab drivers before finding a price we were happy with. It's actually best to find a cab outside of the airport-cabs waiting in the airport need to pay a fee to enter making the fare is higher. The taxi driver dropped us in front of a restaurant near our hotel. The restaurant doors were open and inside we saw colorful outfits, singing and dancing. We stopped in for a beer and enjoyed the lively ambiance and traditional music. Once we finished the beer we headed back out into the city to find our hotel. No street lights were on which greatly complicated things and we only had landmarks to go by- no exact address. We asked one man walking by for help which quickly attracted the attention of several other guys and soon we were surrounded by about 6 guys all eager to give their 'two-cents.' One of the gentlemen used his phone to call the number of the hotel. The hotel owner came and met us- turns out we weren't too far away. We were shown to our beautiful room complete with a roof top balcony. The owner brought us tea and wished us a good night. We woke up with a job to do. We needed to print papers and make copies to bring with us to the Indian Embassy to apply for our Indian visa. (We made copies of our documents twice. The first time we paid 5 rupees a page and the second we paid three times that. The reason was because the second time the computer and printer were being run off of a backup generator.) We walked to the embassy passing whizzing and honking mopeds, a cow laying in the middle of the street, piles upon piles of trash, and several monkeys climbing on walls over head. Welcome to Nepal. When we arrived at the embassy we learned that we could redo our application and apply for a multiple entry application instead of a single entry. This will make our travel much more flexible so we will have to return to the embassy again! Our next stop was Thamel road, a busy tourist street lined with shops selling beautiful bright fabrics, Tibetan singing bowls, incense, bootleg hiking gear, Kukri swords, and other souvenirs. The street was buzzing with people and mopeds weaving and honking, driving on the opposite side of the road. It's very difficult to drown out the incessant honking (it literally never stops).Trash covers every surface, discarded carelessly all over the ground. Empty lots are filled with trash, some burn their trash to dispose it, only to contribute to the already monumental levels of air pollution. 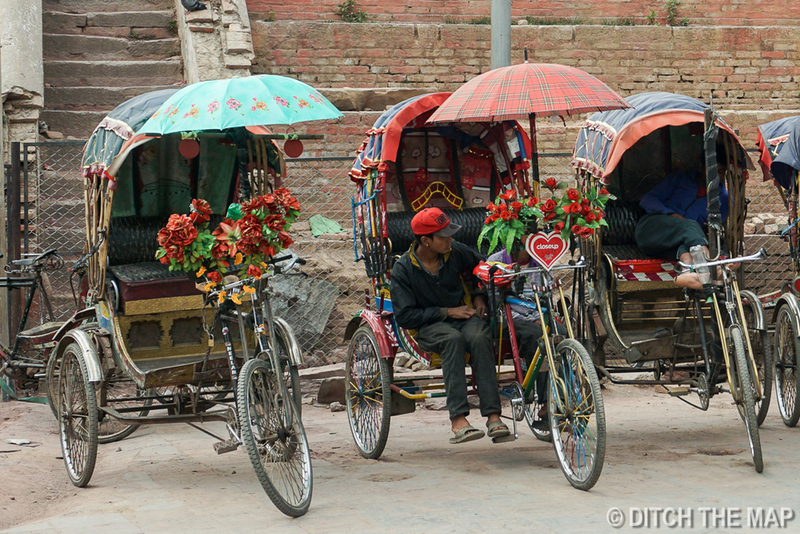 We walked further down Thamel toward Durbar Square, mesmerized by the sounds, smells and colors of the city. Well, actually, aside from the bright colored fabrics and dresses displayed in store fronts, the rest of the city is covered by dust and smog. The sky was a constant white-grey during our stay. To protect from the dust and high level of pollution, many locals have taken to wearing fun fabric-covered surgical masks. Upon reaching Durbar Square we were immediately accosted by security and asked to pay $20 to enter (while locals just strolled right in- pretty sure they use skin color as the indicator for who pays and who doesn't) Durbar Square is home to the old Royal Palace and dozens of temples. The Kumari (princess), or Living Goddess also lives in a building inside the square. She is a young girl believed to be a manifestation of the divine female energy, Devi. When she has her first period she is replaced by another Kumari. 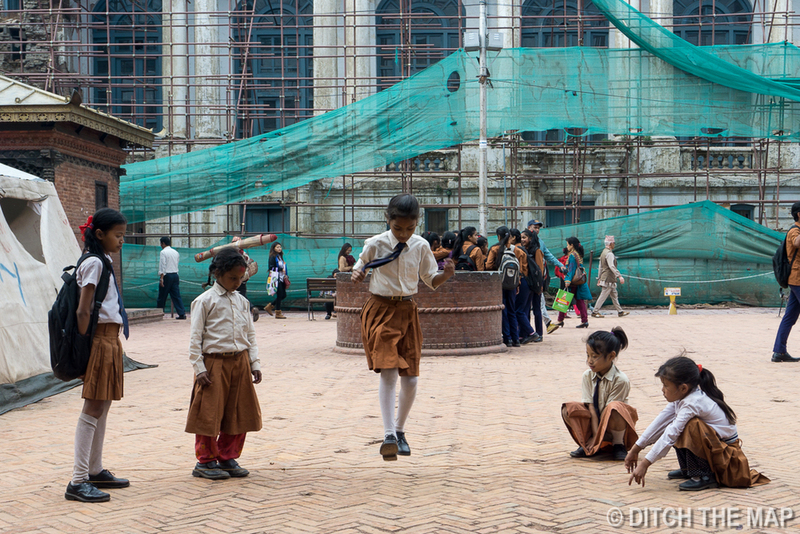 Durbar square was a depressing sight, only a shadow of what it once was- we hadn't realized just how much the earth quake in 2015 had devastated Nepal until witnessing it first hand. Piles of stones and bricks lay everywhere and temples were held up by wooden possupports. From Durbar Square we found our way to Freak Street, named for the hippies that descended up on the area in the 1960's and 1970's drawn by the cheap government run hashish shops. Dread-locked hippies can still be found in this area as well as dealers selling hashish in side alleys. We wanted to make use of the kitchen in our apartment-style hotel room so we went shopping for food. Not many stores use refrigeration, which limits what they sell. Those that do use refrigerators oftentimes use them for beer and colas only. The power station can not generate enough electricity for everyone, so they use 'load sharing' between different districts, allowing several hours of electricity per district during certain times of the day. (Almost everyone uses back up generators to get by- even if only for their TV's) Needless to say, none of the meat is refrigerated. But if you're adventurous enough you can find butcher shops with slabs of meat exposed to the sun and air (legs, feet, or eats still attached), flies, and desperate stray dogs. To get some protein we settled for eggs which are sold in just about every corner shop (also not refrigerated.) They were not refrigerated in South America either. After collecting some fresh vegetables-carrots, beans, onions, chives, for less than 80 cents (The majority of Nepalese live on less than $2 a day), we headed to a spice store. The smell of the store was intoxicating. We randomly selected two spices to use with dinner. Our attraction for the next day was Boudhanath Temple. Being several kilometers outside of the city, we decided to catch a taxi. We negotiated the ride for 600 rupees, 6 USD. (Everything is negotiable!). Traffic on the way to the temple was horrendous in our eyes, but routine for our driver. The drivers here have no shame honking, cutting others off and squeezing between lanes- it is truly every man/woman for himself/herself! The temple was under construction to repair from the earthquake and the top stupa was closed off. This temple, like many others, had its splendor stolen by the earthquake. It's really a sad sight. Nonetheless, the square around the temple was busy with tourists shopping in the souvenir stalls. We had our heart set on finding a Tibetan medicine bowl. But, of course we wanted the perfect bowl for the perfect price. This involved much hunting, negotiating, and differentiating between man-made and machine-made bowls. (The negotiating process becomes very tiresome after awhile. All the shops set the prices for tourists offensively high- stores wanted over $150 for the medium sized bowls we were looking at) The handmade bowls are all unique with different frequencies are harmonics. A rubber tipped mallet is used to strike the bowl and a leather bound one to glide around the edge of the bowl producing a soothing noise and vibration. These bowls can be used for meditation and therapy. Some stores inside the temple complex offered healing therapy sessions where they placed different sized and pitched bowls around you and along your chakra's to induce peacefulness and healing. Annapurna or Everest Base Camp? Back in our area of town we went to several different tour agencies to inquire about hiking treks. We were interested in either Annapurna (Base Camp or Circuit) or Everest Base Camp. The Everest Base Camp hike climbs higher in elevation, requires warmer gear, and a flight to fly to the tiny airport in Lukla--This airport is ranked as one of the world's most dangerous airports because of its short runway length, the 12% incline in the runway and the fact that if you over or undershot the runway there's no second chance and you smash into the mountain. Great. So there's that...and then there's the hike to Annapurna, also beautiful, also a base camp in the Himalayas. You take a bus to get there and the hike is less expensive. Both treks are dotted with tea houses where you stay as opposed to camping. We have some research to do before deciding on which trek to do! The EBC and Annapurna Circuit treks are 15 days while the ABC is a 7 day trek. We considered taking a tour there but are leaning toward doing the trek by ourselves, only buying a porter or guide once we arrive. We were going to start our day visiting the Swayambhunath Temple but opted against it. We've read that many of the monkeys that inhabit the temple are infected with Rabies. Even though we would likely be safe if we kept our distance we didn't want to put a wrench in our plans by getting rabies. We would have to take 5 post-exposure shots over the following 28 days. Instead we walked around getting last minute supplies. First we picked up a bunch of pens, coloring pencils, stickers, and notebooks for the children at the Orphanage (more on this below). We bought some suntan lotion and bug spray. The bug spray was hard to find since the trekking stores in town cater to trips into the mountains, an area where there are no bugs. We were able to locate one small bottle with 20% DEET (this is Nepal's upper legal limit for DEET). Oh, and I can't forget about the port wine we picked up! At one pharmacy we picked up a couple weeks supply of Doxycycline (anti-malaria) and four Azithromycin tablets (traveler's diarrhea). We inquired about a certain type of anti-anxiety medication, which is oftentimes used by traveler’s during long bus/train rides to help sleep through the noise and smells. The first pharmacy said that we needed a prescription. However we chatted up the second pharmacist we went to and were able to get a couple dozen pills. Wow, so much easier (and cheaper) than in the states! Scott stopped for some Chai tea from a dinky hole-in-the-wall place. He paid 20 rp ($0.20) for the tea, much less than the 200 rp the guy from the other day asked. You have to negotiate everything! Even fruits and vegetables. We were starving but having trouble finding any type of quick eat. Not too far from our guesthouse we found some guy selling food out of a garage. We ordered 2 chapati and watched him make them right. They were great and only cost 30 rp ($0.30). After a long time shopping for the perfect bowl, which involved stopping in many stores, comparing prices, and trying out bowls for the perfect sound. We ended up at a Tibetan Singing Bowl whole-sale store slightly off the main street. We were unimpressed with the bowls in the store, so one of the employees took us up several flights of stairs to their back storage room. The shelves were lined with hundreds of bowls. We used the flashlights on our phones to examine the bowls (the power was out, no surprise there). After much scrutinizing we narrowed our choices down and finally asked the price. He quoted us $150 USD for the first bowl and $70 for the smaller bowl. This price was unacceptable, we told him that was too much and that we had seen them for cheaper else where. He lowered the prices, asking if we were satisfied yet. We were not and he asked us to name our prices (this is usually what the negotiation process comes down to) We said $90 for both. There was long awkward silence. Finally he said he would give us the bowls but under two conditions, we had to put the bowls in our backpack and leave in another direction not passing the store, and not coming back into the store. He was afraid his boss would find out. His plan was to pocket the money and never tell his boss about the sale. Despite the shady circumstance we stoked by the deal and paid $90! Later we met a hippie on the street who spends 5 months in India and Nepal a year buying items to sell back home in Canada. He informed us that he gets these medicine bowls for about $25 a kilo (whole-sale). We also bought a table runner made from scraps of saris. Our next destination was the post office to mail home our goodies. After a long walk there it was closed. It doesn't open again until 2pm the next day, delaying our arrival at the orphanage. 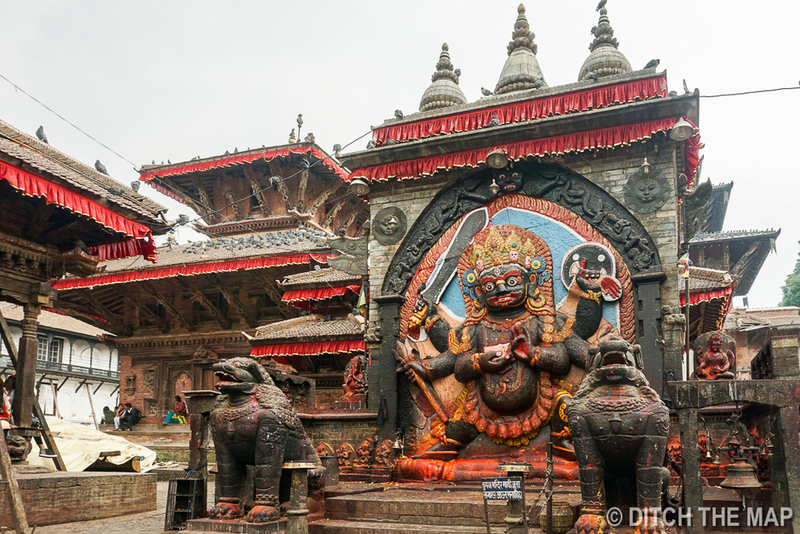 Today we leave Kathmandu and will be taking a public bus towards Pokhara and getting off at Mahadevbesi , which is in the Dhading District. Here we will help to build an orphanage for children who lost their parents during the 2015 earthquake. During the morning and nights we will work with the children, but during the days while the kids are at school we will be building. We will be staying with the family but we will have our own rooms. There are no showers and we're expected to bathe in a nearby river. Also, there is only one outdoor toilet for everyone to use. We still need to buy a couple of mosquito nets on our way to the bus station this afternoon. We are not sure how long we will work at the orphanage. Depending on our experience we may stay anywhere from 1 to 3 weeks. We will return to Kathmandu after our time with the host family to extend our tourist visa. Then we are off to trek either Everest Base Camp or the Annapurna Circuit--both of which are 15 days long.